The NBA All Star Game is Feb. 17. We’ll celebrate the world’s greatest athletes. Some guys are so famous you know them by their first names: LeBron, Giannis, Steph, Kawhi, etc. But what about the players who have been terrible this season? How about the Not-All Stars? Here at The Comeback, we have assembled the worst starting lineup in the NBA. We used an objective metric in our analysis: real plus-minus. Real plus-minus gauges the impact of a player on his team’s net efficiency (points scored minus points allowed (per 100 possessions)). It also adjusts for teammates and opponents. The following players have the worst real plus-minus ratings at their positions according to ESPN. Not surprisingly, four of our Not All-Stars are rookies. First-year players rarely make a positive contribution to winning. Marvin Bagley might be the answer to a trivia question someday. The second overall pick was taken one spot before Luka Doncic, who was picked by the Atlanta Hawks before being traded to the Dallas Mavericks. Doncic is a virtual lock to be NBA Rookie of the Year. Bagley (13.2 ppg, 6.9 rpg) has been a role player for vastly improved Sacramento. The Kings (28-25) have already won more games than last year primarily due to an increase pace of play keyed by second-year point guard De’Aaron Fox. But Bagley’s contributions to that have been a mixed bag. Right now, he can’t beat out 30-year-old Nemanja Bjelica, who had been mostly a reserve for his entire career. The Kings have been substantially better with Bjelica on the court. His real plus-minus (+2.84) is seventh in the NBA among power forwards – just ahead of him are guys like Blake Griffin and Draymond Green. Kings coach Dave Joerger want to win games now, so Bjelica’s been a better option. Obviously, management would like to see Bagley develop, but he’s been an inconsistent defensive rebounder and not efficient on offense. Fox struggled as a rookie, but made a big leap in his second year. Perhaps Bagley will do the same. He did have his best game of his young career against the Spurs on Monday, with 24 points and 12 rebounds off the bench (and a ridiculous dunk). It’s alarming that Orlando may already be ready to give up on the sixth overall pick of the draft. According to ESPN’s Brian Windhorst, the Magic recently put the seven-footer on the market. Well, it looks like he won’t be going anywhere now.It was reported on Tuesday that Bamba is out indefinitely after being diagnosed with a stress fracture in his lower left leg. Bamba (6.2 ppg, 5.0 rpg, 1.4 bpg) has been pretty much what most people expected as a rookie- he’s raw. In limited minutes, his averages aren’t terrible. But in the overall scheme, Bamba has been a liability when on the court. Orlando has a -17.0-net rating with Bamba on the floor. He’s been particularly bad on the offensive end. Again, this isn’t surprising. There were legitimate questions about Bamba considering he wasn’t a largely impactful player at Texas. Despite being a prized recruit, the Longhorns were 19-15 last season — Bamba’s only year with the team — and they were knocked out of the first round of the NCAA tournament. What made Bamba an intriguing prospect was his terrifying 7’10” wingspan and terrific athleticism to go with it. Orlando drafted two of the best centers in NBA history. Bamba, however, is not Shaquille O’Neal or Dwight Howard. Bamba’s lack of strength and skill makes it hard for him to keep him on the floor. Wait a minute. Jamal Crawford is STILL in the NBA? Yep, that’s right. Crawford, who was drafted in 2000, remains in the Association. Suns teammate Devin Booker was 5 years old when Crawford made his pro debut. Crawford (6.5 ppg) probably owns socks older than Booker. Crawford (38) is the league’s third oldest player behind Vince Carter (42) and Dirk Nowitzki (40). The lone veteran on this list has lasted this long because he’s instant offense (14.7 career scoring average), winning the league’s Sixth Man of the Year three times. And just when you think the journeyman is way past his expiration date, he’ll find a way to score 22 points against the Spurs. While James Harden perfected the art of the four-point play, the NBA’s all-time leader is Crawford (53). But…. he’s on pace to have his worst scoring season since his second year in the league when he averaged 9.3 for the 2001-02 Chicago Bulls. Why is Crawford on the Suns? He originally signed to give them a veteran presence. He was a reserve last year on the Minnesota Timberwolves, who made the playoffs after a 13-year drought. But now Crawford is on a bad team and can’t shoot anymore (36.4 percent). At 19 years old, Kevin Knox was the second-youngest player in the draft. He was considered to have plenty of upside and drew some Kevin Durant comparisons out of Kentucky. He also created a lot of buzz during the Summer League, where he averaged 21.3 points and 6.5 rebounds. Everyone seemed to ignore that he shot 35 percent. Well, Knox (12.6 ppg) hasn’t been much better now that the games count. He’s shooting 33.9 percent from three-point range and a woeful 39.7 from inside the arc (He’s at 37.1 overall). The Durant comparison seems laughable. Durant has never shot lower than 43 percent in his career. Knox has certainly shown flashes; he was the Eastern Conference Rookie of the Month in December. Admittedly, the Knicks’ roster has hindered Knox’s development. The Knicks have been playing without a competent point guard. Dennis Smith Jr., acquired in the Kristaps Porzingis trade, might help Knox. There are also questions about how Knicks’ coach David Fizdale is using Knox. New York hasn’t run many plays with Knox having the ball in his hands. But what is most concerning? Knox so far hasn’t even been the Knicks’ best rookie. Undrafted free agent Allonzo Trier and second-round pick Mitchell Robinson have been more valuable players. Strangely, Knox said he felt snubbed for not being named to the Rising Stars of All-Star Weekend. He said this after going 6-of-16 for 17 points and being minus-22 in a 114-90 loss to Dallas. Here he is ladies and gentlemen: the NBA’s worst player. 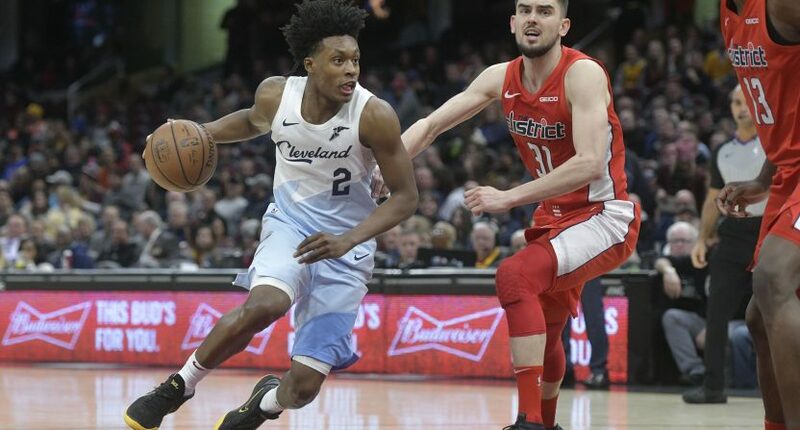 The Cleveland Cavaliers top draft choice — the eighth overall pick — is dead last in the entire NBA in real plus-minus. Sexton is on pace to post the worst real plus-minus rating by any player in four years. Remember these guys from the 2014-15 season? Bennett was infamously the NBA top overall draft choice in 2013 for the Cavaliers. He might be the worst No.1 pick of all-time. Sexton (14.3 ppg) isn’t that bad, but he’s the second-leading scorer on a horrible team. Cleveland (11-43) is the league’s worst in terms of scoring differential (-10.8). Somebody must get the points and Sexton needs experience. So, he’s out there jacking up shots at a 40.3 percent clip while his team is getting routinely blown out. Recently in an 111-98 loss to the Mavericks, Sexton scored 13 points the hard way: 4 of 17 from the field in 31 minutes. He’s one of the league’s least efficient players.